The goods must appear in the Dangerous Goods List. The packages must be above the limited quantity figures permitted for the goods. The total load must be above the load threshold for the category of the goods. The operator must supply the correct markings and the driver must use them. It’s an offence to display markings when the dangerous good are no longer present. 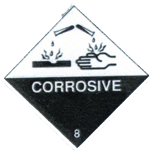 A vehicle carrying packaged dangerous goods must display an orange plate to the front and rear. The plate must measure 300 mm high x 400 mm wide with a 15 mm black border. When packaged good are carried in a container the container must display the correct placard(s) (diamond) on all 4 sides of the vehicle.